There were quite a few new features along with a collection of improvements added to the Payroll product in Sage HRMS 2015. Let’s take a look at these changes to both U.S. and Canadian payroll. Sage HRMS Payroll (both U.S. and Canadian versions) now offers a Gross-Up Calculator that can be accessed from the Quick Launch Toolbar. After entering the Desired Net Pay, you can choose the employee earnings, taxes, and deductions. Next you can override amounts as needed and the calculator determines the gross amount to pay. Once you have the right configuration, you can generate a timecard with the calculation to be used directly in your standard payroll processing. 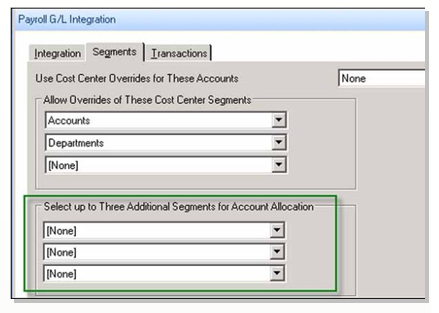 If you have selected to Use Cost Center Overrides in Payroll G/L Integration, the General Ledger segments can now post with six segments for earnings, deductions, and taxes set up with cost center override. Prior to this enhancement, only three segments could be assigned. This change means payroll can use the segments from the employee-level setup or the time card if they use the Regular Expense account. In order for the segments to post to your G/L, you must select the checkbox Cost Center Override Allocated Based on Calc Base on the Earning/Deduction or Tax code setup. Update Local Taxes Audit Report (U.S.) - new option to audit and review a summary of tax changes. The payroll enhancements included in Sage HRMS 2015 make an already great product even more flexible so you can customize the system to handle payroll your way. Contact us if you have questions about Sage HRMS or want to discuss an upgrade to Version 2015. Click to download the Sage HRMS 2015 Release Notes for the full collection of upgrades.